1. Preheat the oven to 220°C, gas mark 7. Using a small knife, cut the bone out of the chicken thighs and discard, alternatively use 4 boneless chicken thigh fillets. Open the thighs out flat, skin-side down. 2. Preheat a large, non-stick frying pan. In a separate bowl mix the crushed garlic cloves with the thyme leaves, white wine vinegar (or lemon juice), olive oil and some seasoning. 3. Brush the mixture over the chicken and cook in the frying pan, skin-side down, over a medium heat for 12 minutes until very crispy. Meanwhile, spread the oven fries onto a large baking sheet and bake for 12-15 minutes until cooked through and golden. Turn over the chicken thighs and cook for a further 5 minutes (take care as there will be some spitting and spluttering). Check that the chicken is completely cooked through, there is no pink meat and the juices run clear, then cut into strips. 4. 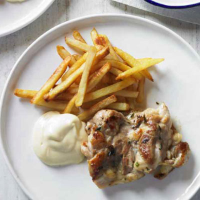 Mix together some mayonnaise and mustard to serve alongside the chicken and mixed salad.